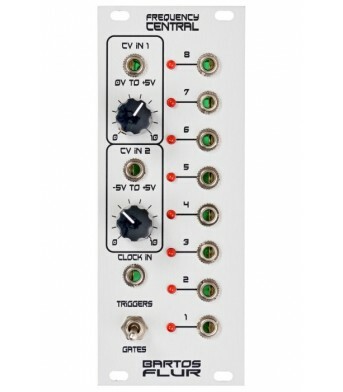 Bartos Flur Bartos Flur is a CV to trigger/gate generator. It analyses incoming CV ..
Continuum Phase Shifter Continuum has it’s roots in my previous guitar effects peda..
Electro Cardiogram VCF/VCA The ECG is a diode ladder filter and uses 6 x red LEDs f..
Loop/Env Generator Frequency Central “Loop/Env Generator” The LOOP/ENV is a Volt..
Meth Amp Meth Amp is based around the fuzz core of the EH Big Muff pedal. Lovely fu.. 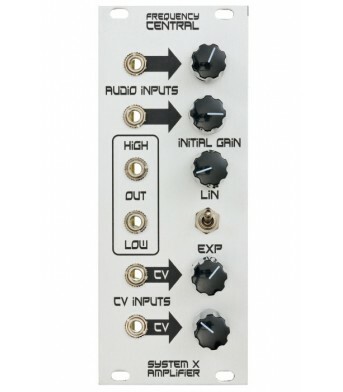 Raging Bull Raging Bull is based on the legendary Moog Taurus Mk I V..
System X Amplifier Frequency Central “System X Amplifier” Roland 100M based VCA for Eu..
System X Envelope I’m happy to announce the second module in my Roland System 100M ..